Dr. Annemieke Zante is a specialist in pathology based in San Francisco, California. She has more than 13 years of experience in the medical field. She graduated the medical school of the University of California San Francisco in 2004 and proceeded with a residency stage at the University of California San Francisco and a fellowship at the same medical institution. Dr. Zante is a board-certified practitioner in anatomic pathology and cytopathology. She contributed to several published studies and some of the subjects she covered are adenoid cystic carcinoma, microsurgical fibular free flap reconstruction, oral tongue squamous cell carcinoma, oesophageal cancer, pulmonary nodules and fine needle aspiration biopsy, human pancreatic cancer cells. 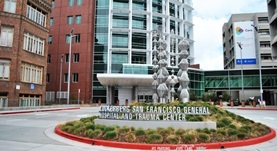 Dr. Annemieke Zante is affiliated with the San Francisco General Hospital. Dr. Annemieke Zante has contributed to 2 publications. Fatty Acid binding protein 7 is a molecular marker in adenoid cystic carcinoma of the salivary glands: implications for clinical significance. Phuchareon, J.,Overdevest, J. B.,McCormick, F.,Eisele, D. W.,van Zante, A.,Tetsu, O.; Transl Oncol. 2014 Dec 17.
c-Kit Expression is Rate-Limiting for Stem Cell Factor-Mediated Disease Progression in Adenoid Cystic Carcinoma of the Salivary Glands. Phuchareon, J.,van Zante, A.,Overdevest, J. B.,McCormick, F.,Eisele, D. W.,Tetsu, O.; Transl Oncol. 2014 Nov 13.